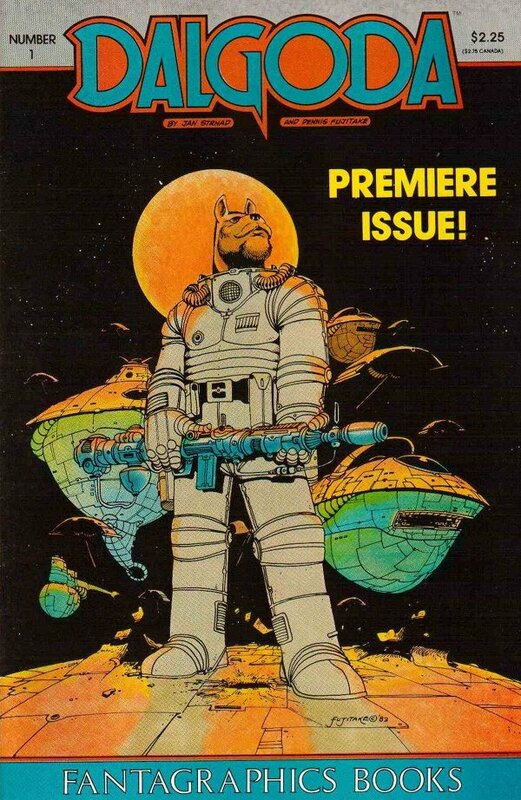 Dalgoda was probably the first Fantagraphics comic book series I followed; it was certainly the first Fantagraphics series I saw in the comic book stores on a regular basis. It featured writing by former Warren and DC writer Jan Strnad and art by Dennis Fujitake, an illustrator who had contributed to Gary Groth-related publications since they were being made in Gary's bedroom by counting out the characters in each line of type and spacing accordingly. My memory is that it was superior genre work -- or at least better than 95 percent of what was on the stands -- and reasonably accessible to fans of general, light-hearted science fiction. It was leisurely paced, and had a genial tone; it was neither pompous nor self-loathing. The art featured that somewhat peculiar, can-still-spot-it-across-the-room Fantagraphics coloring from that era. In fact, Fujitake's art, with its blend of mainstream rendering values, meticulous environmental detail and humorous exaggeration, is what lingers on in memory. Dalgoda was distinguished by a second run of issues under a different name (Flesh & Bones) with a new #1 -- one supposes for the reason that was always done, although I wonder after it coming back under an imprint and the effects of that period's boom/bust -- and two quality back-ups: the fondly remembered Kevin Nowlan-drawn, elves-in-decline fantasy back-up feature "Grimwood's Daughter" in the first series; "The Bojeffries Saga" in the second. Both comics series were essentially Dalgoda to me; I was either unwilling or unable to make such distinctions as a high-schooler, and I defer to him now. "Grimwood's Daughter" was also written by Strnad, and as far as I know remains a potential get for any of you movie-development types out there looking for obscure properties that aren't already aligned by group fiat or collective arrangement. Back-up features were a part of what gave independent comics perceived value: in that era, those comics routinely cost more than the average super-effort. The back-ups were also a sign, I think, that the independent and alt-companies had more material they wanted to publish than they could publish -- something we may think of as a modern affliction. I mentioned to a friend who still occasionally reads comics that I was going to write about Dalgoda soon and he said he'd buy that comic today. It's kind of odd to imagine, but I wonder if that exact content came out this summer if it wouldn't have the same position in the marketplace that these books did 28 years ago. That may say a lot about those comics, and even more about the market.